Pennsylvania lost treasure are buried throughout the State. Listed on this page are a few areas that may hold treasures. However, as stories about buried treasures are told, the information changes over the years. And because of this reason, it is important to research every treasure you want to search for. What I have given you here, is just the starting point in your search. This information should be researched through other means as well. Never rely on one piece of information about a treasure story you are researching. Use multiple research tools. A good place to begin your search for Pennsylvania lost treasure is the Internet. But do not relay solely on that information alone. You should also visit the historical societies in the area you will be searching. Either visit in person, or use the Internet and visit their webpage’s. Read old newspaper articles, old books on the history of the area. Ask questions and follow up with more research. The more information you have, the better chance you will have of locating a treasure. Buried treasures are out there, and people do find them. 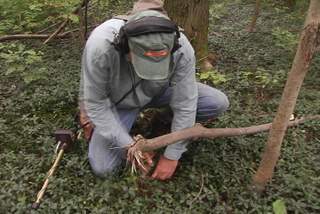 Using a metal detector to search for Pennsylvania lost treasure is a must have tool. Before the days of metal detectors the chance of locating buried treasures was not a very high percentage adventure. However, today’s modern detectors give anyone with the desire to locate a treasure, a much better chance of finding one. Good luck! And have fun in your search for Pennsylvania lost treasure. Located on route 30, not far from Malvern, was the scene of a large battle between George Washington and the British in September 1777. Apparently, during the battle a major rain storm pelted the troops causing a flood and the loss of equipment and personnal belongings. There may be many relics, which could amount to small treasures in the area. This town was settled in 1720. During the French and Idian War it was a large military base, as well as a stop over for settlers heading west. Because Carlisle served as a military fort, it's inhabitants may have buried their personnal belongings for safekeeping. The reason was because they were always aware of pending attacks. And due to death, buried treasures may still be in the area. Located in Norristown on the Schuylkill River. During the late 1600's and into the late 1700's this area was used as a large communications point and campsite during the settlement of Pennsylvania. Many troops camped and walked this area. Small treasures lost or buried may be waiting to be found. Approximately three miles southwest of Chester, on the bank of the Delaware River is a buried treasure consisting of 38,000 pieces of eight. The treasure was taken in 1742, by pirates that captured the Spanish ship San Ignacio El Grande. After burying the treasure, the pirates went to Philadelphia. A few weeks later they returned to the area but were unable to locate the treasure due to flooding that had occurred while they were in Philadelphia. Located off Lake Erie on route 955. The steamer Erie wrecked near Lawrence Park. It was carrying $200,000 in gold coins. Throughout the years, gold coins have washed up onto the shores of Lake Erie near the park. This is a large area to search for that Pennsylvania lost treasure. Located twelve miles northeast of Lawrence Park. It has been rumored that American silver dollars from the late nineteenth century have been found in the area of Orchard Beach. The coins may be from a wrecked ship off shore. Located approximately five miles northeast of Mount Jewitt and crosses the Kinzua Creek. In the late 1800's, $60,000 in gold coins and paper currency was stolen from the Emporium Bank and then was buried on one side of the bridge. Somewhere on the banks of the Potato River near Crosby, is buried approximately $5 million in gold and silver bullion. The treasure was buried by the old, eccentric millionaire, Colonel Noah Parker. 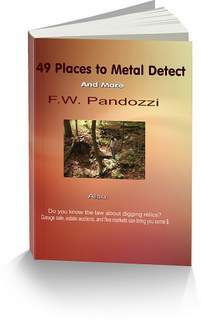 Are You Interested In A Metal Detector Or Accessories to help you in your search for Pennsylvania treasure? Know what the laws are about digging artifacts. And you may find Pennsylvania lost treasure in these areas.